When You See ‘The Amazing Spider-Man’ at the Historic Texas Theatre, Get a FREE Spider-Man T-Shirt!!! 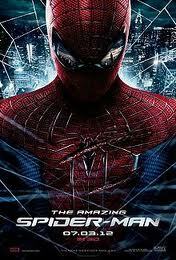 ‘The Amazing Spider-Man’ is now playing at the Texas Theatre in Oak Cliff. They are doing a very cool promotion that if you purchase at ticket to see ‘The Amazing Spider-Man’, then you will get a FREE Spider-Man T-Shirt. *These are only while supplies last. * So hurry on up to the Texas Theatre, grab a drink, listen to a record, watch the BEST Spider-Man film yet, and get a FREE T-Shirt. And who knows, there might even be some FREE Spider-Man Comics courtesy of Boomstick Comics for you to take. So go on and web-sling over to the Texas Theatre! READ MY SPIDER-MAN MOVIE REVIEW HERE!!! The Awesome Trailer for ‘The Amazing Spider-Man 2’ Is Here!!! Sony Announces ‘Amazing Spider-Man’ 3 & 4!!! Paul Giamatti Might Suit Up for ‘Amazing Spider-Man 2’!! This entry was posted on Thursday, July 12th, 2012 at 10:54 am	and is filed under Comics, Events, Film, News. You can follow any responses to this entry through the RSS 2.0 feed. You can skip to the end and leave a response. Pinging is currently not allowed. « Bryan’s Blu-ray Review of ‘Chariots of Fire’!!! See this? This is us.